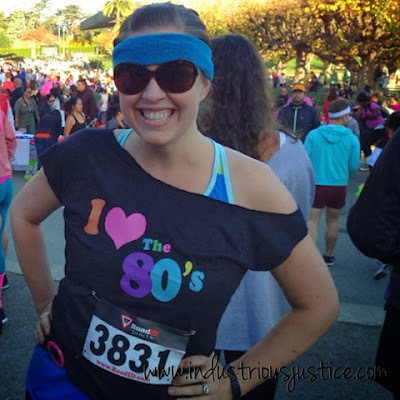 I ran my third 5K two weeks ago! 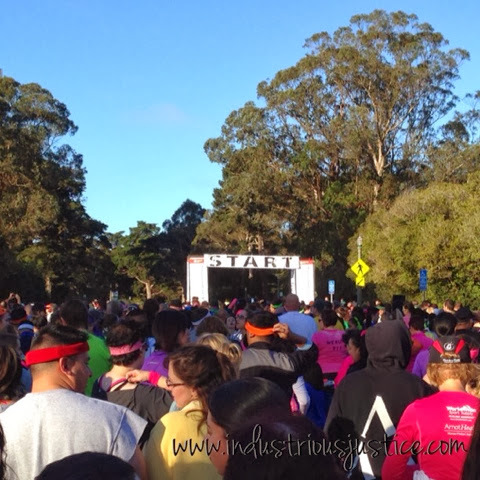 It was the Awesome 80s 5K at Golden Gate Park in San Francisco and we couldn't have asked for a more beautiful day. My friend Josh, who I ran my second 5K with, asked if I was going to try to beat my time from my last 5K. I told him no, this was a "fun run." Ha. Shirt and headband from Amazon. 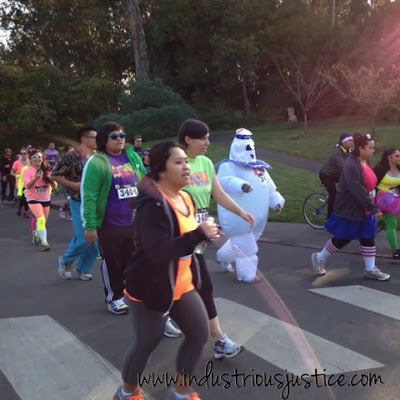 Yes, that is the Stay Puft Marshmallow Man. 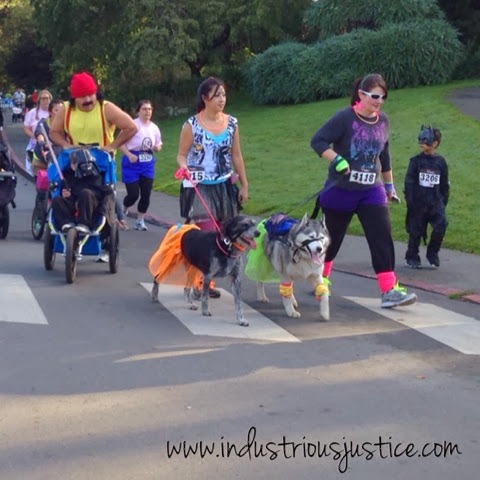 This was a family (both 2- and 4-legged) friendly event. So fun! There was a ton of neon and some seriously fun (and creative) costumes. The mood was so positive and non-competitive. My friend and I kept a good pace and got into a good running and walking groove. Our final time was 40:55 and I was happy with that. Oh, and we got medals! 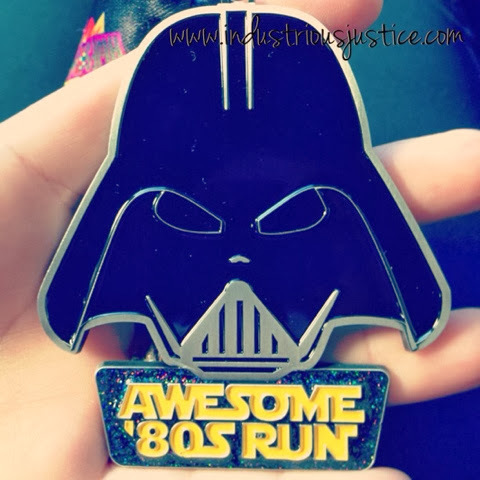 Seriously cute medals and the first one I have ever gotten! I can't even put into words how good that dish was but just imagine the best combination of crispy breakfast potatoes, bacon, tomatoes, greens and sunny side up eggs...all topped with pesto and a perfect balsamic reduction. 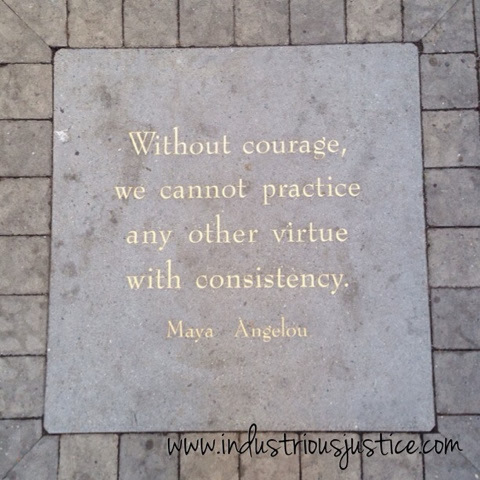 After stuffing our faces, we wandered around and I soon found this Maya Angelou quote at my feet. And yes, I am already signed up for a fourth 5K. It will be a "Hot Chocolate" 5K in January. I will be running that one with the same friend from this 5K as well as my friend from my first 5K and my honey. My goal for that one will be to run the entire time. I will probably be slow but I will do it! ...and soup! I am writing this post about soup while eating leftovers of SkinnyTaste's Broccoli Cheese & Potato Soup for breakfast. Just keeping it real. I was inspired to make this curried squash soup after receiving a sugar pie squash in our CSA box and when a friend posted a photo of a homemade acorn squash soup on Instagram. 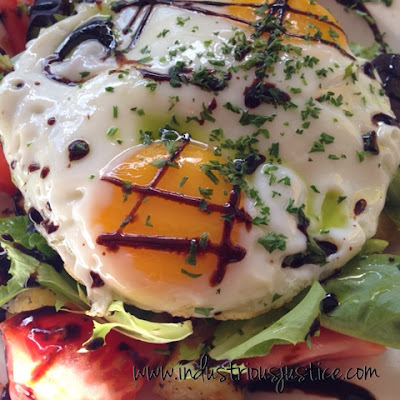 I knew this recipe was a keeper when I said, "I would totally make this again," and my honey immediately responded with, "I would totally eat this again." First things first, what is a sugar pie squash?? Based on my quick internet research, it is a variety of pumpkin. I didn't weigh it but I would guess 3 pounds or so. Roasting your own squash for this soup takes time but I think it is worth it. You can also roast it ahead of time, like I did, so the soup itself can be a fairly quick, weeknight dinner. Roasted squash, ready to be scooped out! Butter + onion + curry powder = Best. Smell. Ever. Preheat your oven to 350º and line a baking sheet with a piece of parchment paper. Get a good, sharp knife and cut off the top of the squash to remove the stem. Carefully slice in half down the middle. Using a metal spoon or metal ice cream scoop, dig out all of the seeds and stringies. Spray each half with a bit of cooking spray and lay flesh-side down on the baking sheet. Bake the squash until it is nice and tender and the skin is easily pierced by a fork, probably about an hour. Remove the squash from the oven and let cool for 10 minutes. Scoop out the insides and set aside immediate use or put into an airtight container for refrigerating and saving for later. Melt butter in a large soup pot or dutch oven over medium heat. Add onion and 2 teaspoons curry powder. Cook, stirring occasionally, until the onion has softened, 5-7 minutes. If a crust begins to form on the bottom of the pan, add a splash of chicken broth to deglaze. Add reserved squash insides and the chicken broth to the onion mixture. Stir and bring to a simmer. Let it go, stirring occasionally, for 20 minutes. While the soup is simmering, crisp up the pancetta. Heat a small frying pan over medium heat, add the pancetta and cook until dark and crispy, about 5 minutes. Remove pancetta to a paper towel lined plate to drain. Taste the soup and if you want a stronger curry flavor, add another 1/2 - 1 teaspoon now. Stir in the nutmeg and half-and-half and allow the flavors to mingle, without a simmer, for another 5-minutes. Remove from heat and salt and pepper to taste. Ladle soup into bowls and sprinkle with crispy pancetta.